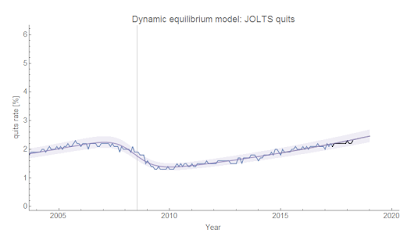 Another month, another JOLTS data release. However it looks like this time I can with a certain level of confidence say that the "2019" recession  is underway. 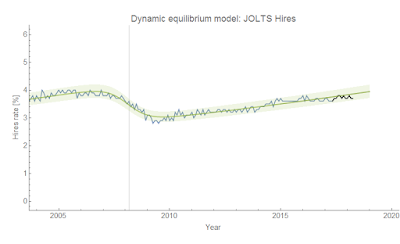 It's still not as visible in the hires or quits data (only as biased model error), but job openings (vacancies) are definitely showing a deviation. Job openings appears to have lead the early 2000s recession (but that conclusion is uncertain as JOLTS data is only available from December 2000). 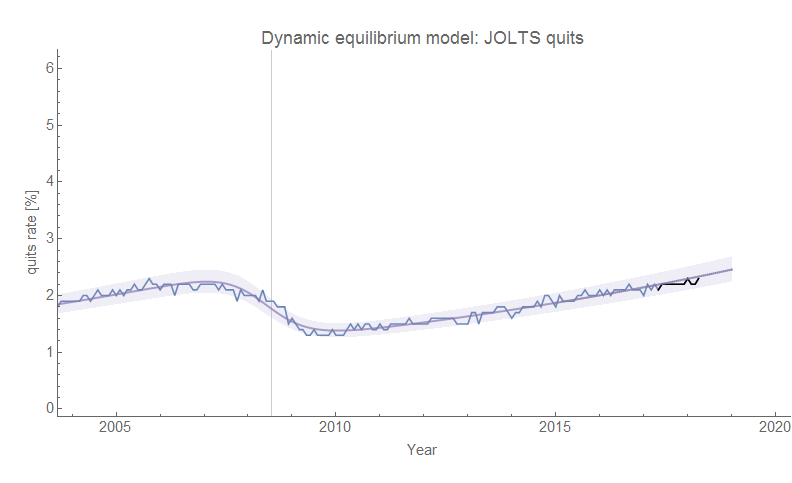 Since this is a bold prediction, let me show the updates for all the JOLTS data series I've been watching. Click to enlarge the images. To be specific, my prediction is that the current JOLTS job openings data is going to continue to deviate forming a shock (a logistic step function after subtracting the log-linear component) that will become visible (i.e. detectable with e.g. 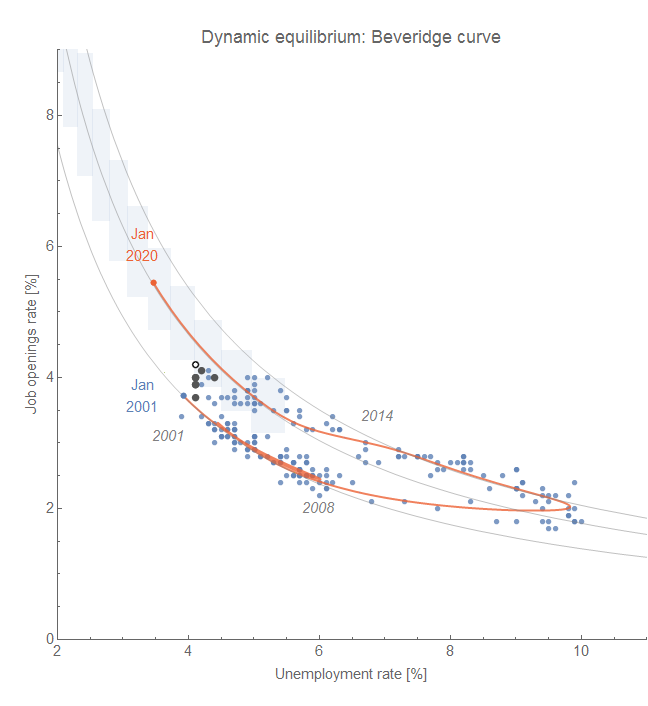 this algorithm) in the unemployment rate as originally described here but also in my paper. 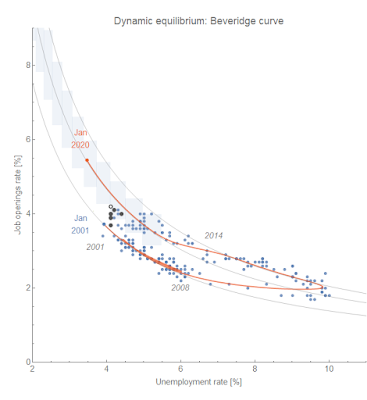 The exact timing of the NBER recession is uncertain (since it seems to depend more on the unemployment rate, which lagged the JOLTS indicators in the previous recession), but the time scale appears to be 2-4 quarters (6 months to a year). The unemployment shock center matches up with the NBER recession centers within a month or two on average. One issue is possible data revisions; they appear to come with the March update (per ALFRED) with February data with the big Fed March meeting, so we won't see any until March 2019. 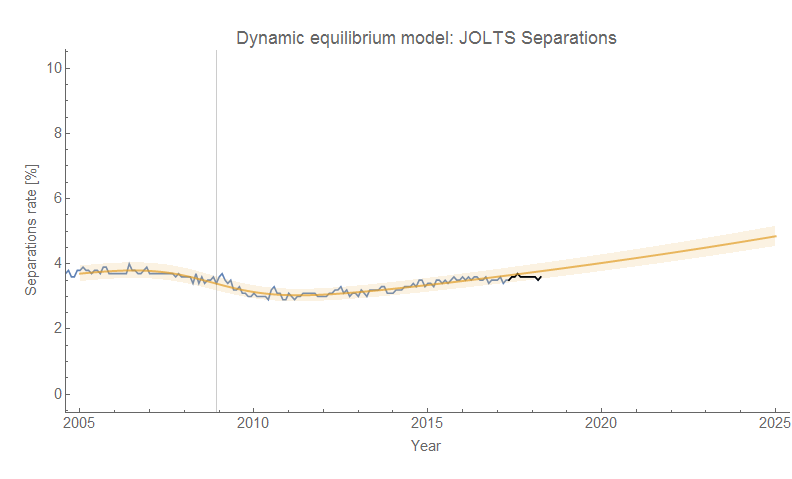 However, the revisions all appear to be on the order of the model error so the only worry would be biased errors that shift all the data one way (this happened last March for the quits and hires rates). But overall, I'd say I'm at least 80% confident in this prediction inasmuch as I can put a qualitative Bayesian prior on the model. 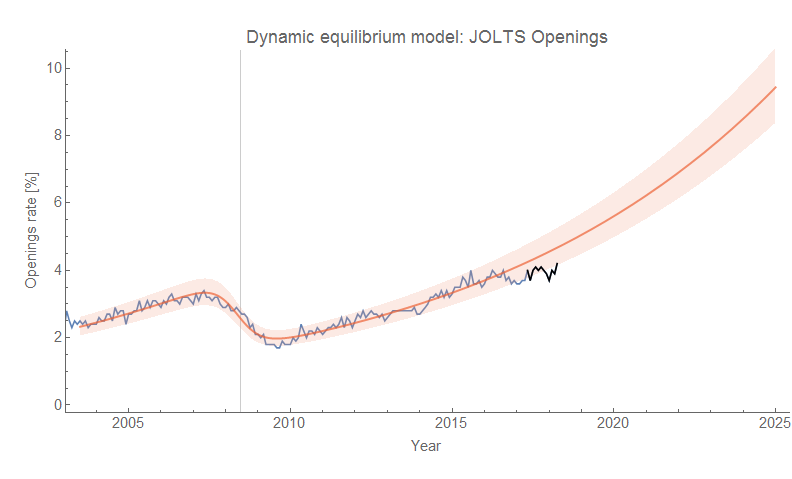 I put quotes around the 2019 because the recession is technically already visible in the Job Openings data, but NBER will likely say it began (i.e. the business cycle peaked) in some quarter of 2019 as the unemployment rate shock is probably at least 6 months in the future. I appreciate your confidence to get way out on a limb on this one, Jason! Will be fun to watch what happens. 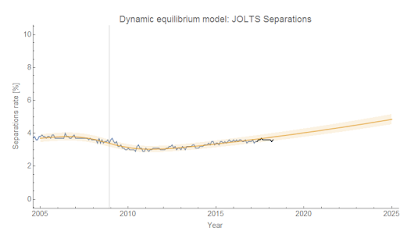 But this is one of the best ways test a model: making a prediction.